Food Librarian The Food Librarian: Eat My Blog Charity Bake Sale - Tomorrow!!! Come on out to Eat My Blog Charity Bake Sale on Saturday, December 5th! That's tomorrow!! 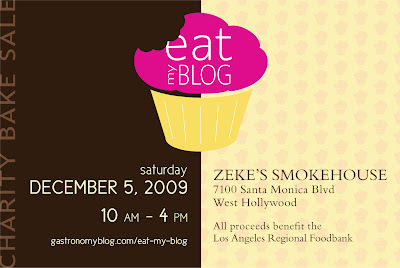 It is from 10 am - 4 pm at Zeke's Smokehouse in West Hollywood. More info here and a menu on LA Weekly here...there are sooo many treats I want! All to benefit the Los Angeles Regional Food Bank - what a great cause! Gluten-free legal crack. Sure, it has just a few ingredients, but you'll get hooked. Recipe here. My favorite bundt is all yours! Recipe here. And don't forget to head to Unique LA in Downtown LA to do your shopping! P.S. Happy Birthday Helen!!! 50!! You rock! I think it's fantastic that the LA food bloggers are doing this! I'm hoping that next year I can convince some Baltimore food bloggers to do the same! PS--I wish I was closer so I could buy one of those baby bundts! I love your packaging! After reading about your month of bundts, I can't wait to finally taste one. Thanks for baking with us! I wish I lived anywhere near! I would buy both of these items. The packaging is great too! Too bad I'm no where close to LA! Anyway, Happy Birthday! Bundts rock!! Oh those are calling my name, but I live too far!! How sweet that you woke up at 2am to make this gorgeous spread! Happy Birthday in advance Mary...hope it's wonderful!! Happy Birthday to you, a bit early! Just in case I forget on Monday. I found your blog by way of FuzzyKoalla's Caketastic Adventures and I am hooked. Wish I was in LA today I would be there at that bake sale in all it's baked goodness! The packaging is fabulous, who wouldn't want to buy these? Will visit often now that I am a follower! I am going to spend some time today reading more of your fantastic blog! I can't believe you woke up at 2am to make these goodies! They look wonderful. Wish I could attend this benefit and hang out with you and buy you a pre-birthday treat! Yum! Some of my foodie friends are participating this bake sale too. I only wish I was in L.A.
2 am??? unbelievable! Totally agree--your packaging was amazing! These are adorable... just absolutely adorable! I love them! The packaging, everything looks fantastic. I thought about you many times last week, wondering if you'd remember... LOL LOL And I'm glad you did; I could never forget, no one else ever had the same birthday as me! A very, very good birthday Mary... all your heart desires for this new year you are starting! Best wishes! yummmm, will try this for sure!